“Esther, a baalas teshuva with degrees from university and a music conservatory, said when she noticed women wearing the shal [cloak/shawl], her first thoughts were, Why is she like this and I’m not? “Articulate and well-versed, she has attracted a group of like-minded women who come to her for classes and encouragement; and she and her friends aren’t shy about approaching other religious women on the street—-or the neighbors in their building—-imploring them to improve their standards of dress or to switch their wig for the preferred scarf. “Some women might be grateful for the spiritual arousal; others, however, feel harassed, especially when they respond in the name of their own mainstream rabbis, whom these women tend to disparage. “Rebbetzin Tziporah Heller…doesn’t think it’s a good idea. She has friends and acquaintances who don shals and radids [long cloaks]—both baalei teshuva who are navigating their own way [CJW: the article’s author estimates that around 80 percent of these women are baalot teshuva, mostly of Sephardic background], and women from Meah Shearim who want to further their already elevated level—and although at the turn of the previous century this mode of dress was prevalent, she says we don’t have to rewrite the rules of our mainstream halachic leadership. “The given is that women should be modest. Then halachah proceeds to tell us what that means, the parts of the body that should be covered, and that married women must cover their hair. Does it require many layers? No. Does it need to be black? No. A woman has to be refined and halachic, and we have to keep in mind that just like women have to take responsibility for modesty, men have to take responsibility for guarding their eyes. “Still, what’s wrong with being stringent, taking on a hiddur [stringency] in this area and being more modest than halachah demands? After I read this article, the first person who popped into my mind was my dear friend Hagit bat Leah Luzon z”l, who passed away two years ago at the age of 39. I didn’t think of Hagit because she dressed anything like these Shal Ladies, but rather because as a Moroccan baalat teshuva she shared the same background as many of them, but yet chose a very different path to express her yearning to serve Hashem. Her hiddur was, as Rebbetzin Heller recommends, completely hidden. It was a few weeks before Rosh Hashana around eight years ago when Hagit knocked on my door. As usual, Hagit was carrying a stack of dresses from her clothing gemach. She handed me a gorgeous pink flowery skirt as well as three matching elegant turquoise dresses for my three older daughters and announced “for Rosh Hashana!” with her sunshine smile that lit up my heart and our entire neighborhood. And over that holiday, as I walked around the neighborhood in my pink flowery skirt, something interesting happened. And in return for dressing my family for the holiday, which would have cost me around $250 if I’d bought the same clothing in stores, Hagit only agreed to take $25. It was her passion, her mission in life. To use clothing to help others and to bring people joy. Hagit left behind five orphans, the oldest of whom is almost bar mitzvah. This struggling family is currently in debt and does not have money to purchase food and new clothing for the upcoming holidays. Please donate generously to the Hagit bat Leah Orphans Fund. May all of us JewishMOMs learn from Hagit. Instead of wearing a sign that said “I’m a Tsaddeikes”—she was one. With her quiet acts of kindness and smile that lifted up so many downtrodden hearts…she was a role model for so many people…including me. Modesty is a very significant halacha to uphold, harder for some than for others. I had a neighbor who felt the V neck on T-shirts for her 1 year old daughter was immodest and she would sew it up before dressing her in it. She mentioned she could not find tops without V necks. But is that modesty or something else? Another lady I know made her daughter wear sleeves that were always covering her elbow, in the scorching hot days of Summer, well before she was 12 years old and required to do so. She claimed her daughter looked older than her age so it was appropriate to require it of her. This woman also did not allow Barbie dolls because Barbie was developed as an adult woman. I do not want to judge these women’s parenting skills but believe they were, in some way I cannot define, being abusive to their children, unintentionally. Now as for the women in the photo dressed all in black like nuns or their Arab Muslim counterparts, they are sending a message to the Rabbis that there is not enough modesty in the frum community, and they are right. I see clothes in Chareidi communities that are way too revealing though knees and elbows are covered and necks are high. Very tight and clingy and sheer. And women who design clothes for the frum community feature these gowns as their collection for modest clothes, thinking a high neck line and long sleeves is after all modest. I once commented to the owner of such a gown manufacturer that it was not modest. Thee reply was that it was meant for thin women to wear rather than those who would not look good in it. This from a woman wearing a sheitel and from a very chareidi background. My reply was that a skinny woman must wear modest clothes too. Never mind all that. It is to make a point as to why the Ballei Teshuvas of Sephardi background are feeling a kinship with the Arabic Muslim women of their same country. Do we not do what Americans do? We do not wear short shorts in the street but clingy dresses are part of American culture. I would highly recommend that flowing non revealing outfits in nice colorful shades and patterns be designed for women who truly cannot find them in our frum communities and who are therefore following the Arab costumes. In fact I will go so far as to say that whatever success the Arabs have had is due to that one aspect of their culture, to dress modestly. May we be zocheh to have shalom in Israel soon with an increase in awareness of what modesty is and is not. Just to comment on that last part- The arab culture is somewhat similar to Jewish culture, in that not all arabs cover themselves up entirely. In fact, there are many arabs that choose to cover up their hair and neck but at the same time wear pants. They too choose what they feel comfortable with, and there is not only one way that arab women dress.. so i don’t think they have really succeeded in this area. Guys, Arabs are a minority in the Muslim world, and not all Arabs are Muslim – many, including those living in Israel and the Palestinian territories, are Christian. Of course different Arabs dress differently! But just to clarify regarding pants, Muslims who observe hijab are allowed to wear pants, as long as they’re not skin-tight, since they don’t have the same prohibition most Orthodox Jews do on showing the inner outline of the upper leg. However they are required to cover the whole neck – unlike Jews. Good to know, thanks. I actually worked with a muslim woman this past year, and she explained to me that there are varying levels of observance in her religion, and people choose what they want to keep. She herself covers her hair and neck in public (although she uncovers it for special events such as weddings, which i thought was interesting). So although they have laws, there are varying levels of observance. They do not only dress differently based on their sect, but also based on their level of observance. Zelda: You’re mistaken and those parents are 100% correct. There is a disagreement between the Chofetz Chaim, who holds girls must start dressing fully tznius at age 3, and the Chazon Ish, who holds girls must dress fully tznis starting no later than age 7. Age 12? They should have been fully tznius long before then either way. yes, our level of tznius is lacking. These thoughts come to my mind. #1: a social level of tznius can bring other non frum Jews closer to Torah and mitzvos. The full covering as Arabs, is very alienating and therefore is not conducive to the mitzva of ahavas yisroel in helping other Jews come closer. We can be tzanua for everyone by being pleasantly dressed modestly. The other way is a feeling of isolation to others, and will not accomplish much in the way of helping our Jewish sisters come closer. I would also like to recommend Rebbitzen Heller’s comment about these women as featured on Naaleh.com’s web site, where she spoke about it as a response to a letter. It was a powerful lesson on how to disagree with someone’s approach to Judaism while still respecting their role as a fully competent person deserving of thoughtful respect. There are different halachik opinions about the age when a girl is required to dress with the same modesty as a grown women. In most Ashkenazic comunites it is 3 years old. What you see as abusive might be right and correct for your neighbor (I know it is for me). As to the Barbie – II too will not have it in the house. Because for me it is an icon of sexual exploitation of women. And I do not think my kids are deprived. There is life without Barbie and Ken. To Zelda, our custom is to dress our girls completely tzanua starting from age 3, and I would also never allow barbie dolls. But there is a big difference between little girls in 3/4 sleeves and cute jumpers and girls wrapped in black shawls! there is more to tznius than covering up. we are daughters of Hashem and need to dress in an appropriate, refined way. The point is to dress in a way that does not draw attention, but at the same time sets a good example. In addition to the basic rules of what it means to dress tznius we need to wear clothing fit for a princess. BLACK SHAULS that look like burkas are not refined or befitting a daughter of HaShem. I think that these women are misguided and taking Halacha into their own hands and minds rather than keeping with actual halacha and minhagei isroael. I believe that this is a dangerous path, especially because they are preaching to others. The rabbonim in their communities MUST put a LOUD stop to this behavior. I especially liked Rebbetzin Heller’s point about the hidur mitzvah being about what makes the person feel better, and nt necessarily Torah- based. Rabbi Nivin talks about asking yourself what your avodat Hashem is at any given time, and to be authentic about it – i.e., motives, repercussions, etc. There is leeway for self-expression and stringency in the laws of tzniut, as long as one adheres to the actual halachot and not their own issues. The shawls are a distortion of modesty, and will turn off people from becoming more dati. I would have never become dati if I had to dress like that. One woman in RBS last year made a comment about my (non-plunging) v-neck, long-sleeved shirt. I told her to stuff it! There are many, many people who might not dress tzenua but do lots of volunteer work. Look at the inside of a person! The inside is what counts – but when women dress in a fashion that draws attention to the outside that is an indirect message that the outside is more important. When the maxi skirt came in (early 1970’s)maybe as a backlash to the ultra minis of the sixties, women who were careful about tznius wouldn’t wear them as they were attention grabbing, even though covered. I view this in the same way. So even though they are not wearing bright red, neon pink, these coverings are “in your face”. I totally understand someone looking to correct past failings and their hearts are in the right place. The tactic seems to be backfiring. We all have to inspire each other to improve without insults and degrading comments. “A general behavioral policy of B’nai Torah and Hasidim is to refrain from speaking with women in a public thoroughfare. This has caused quite a number of women to claim that such behavior was not respectful and was viewed as simply boorish. Is this proper Halacha? Do all Halachic scholars agree with this behavior? Someone tell me…how are what these women are dong not the same thing? I feel that some of this covering up stems from shame..we should not be ashamed of our bodies, Hashem gave them to us to be used as a vessel for kedusha, not to be buried because they are bad..there are many Rebbetzins I know who are always dressed modestly, tastefully, and elegantly. These woman are making a real kiddush Hashem.. This is the most important point, I think. There are many many women- Rebbetzins and laypeople- who are tastefully dressed in a way that is attractive without being attracting. Rebbetzin Heller would be a prime example of this. Yes- there are clothing out there that conforms to the letter of the law without conforming to the spirit of it; whether one chooses to wear those clothing has nothing to do with covering up with a burka and looking like an arab. Um, sorry to break it to you, but “attractive” and “attracting” mean the exact same thing, just that the first is an adjective and the second is a verb. I know that this “attractive but not attracting” phrase is used in tzenius discussions, but there is no distinction between them. You are corect in terms of grammar, but not so in terms of common usage. Attractive carries with it the notion of a pleasing appearance or demeanor. When we say a woman is attractive, we mean that she looks nice. She’s pretty. Her clothes complement her figure, etc. Attracting means that something catches the eye. Things that are incredibly ugly or just strange looking also attract the eye, but no one (except a language pedant) would call them attractive. As I wrote in a previous reply, I believe that Tzniyus is about avoiding attraction. No one should be looking at you specifically because you stand out. That doesn’t mean that you can’t look nice! 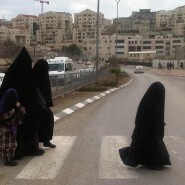 Covering up in a burka in the middle of Bet Shemesh or Meah Shearim is the furthest thing from unattracting. Everyone looks at you. Many start whispering and pointing (and even taking pictures). How can this possibly be called Tzniyus? Other well accepted hiddur mitzvahs also include things people see. Some people put on a second set of tefilin every morning. People see this in shul. Should they also stop? Others were a snood over a wig, must they stop since people see this hiddur? So why then is this hiddur of the so-called shawl women any different? It isn’t. And as stated this was a common form of dress for Jewish women in the Oriental countries. And various traditional Sefardic seforim actually insist this form of dress is mandatory. It certainly was the custom in various communities of yesteryear. Just because it makes some people uneasy today does not mean it must be given up. There is no tradition for wearing six skirts and ten layers of shirts. If you want to take the lady from Meah Shearim who put on a shawl like her great-grandmother and say that is mesorah, I can hear it. But not one person from the Sephardic communities dressed like these women do now. When you look at pictures (from a hundred years ago), they are wearing light summery, light colored flowing robes- more reminiscent of an Indian sari than an Arab burka. I think if these women really would dress like their great-grandmothers, the look would be completely different, and much less attracting! Personally, I have no problem with women dressing in the shal, but I do have a problem when women try to tell others how they should dress. That’s approaching evangelism, and we don’t do that. Kiruv is done best by example, not by lecturing. For example, I’m Charedi, and I live in a VERY MO/Conservadox neighborhood. I would never dream of telling anyone else that my way of dressing is better, even if I’m thinking it in my head. If someone wants to talk to me about tzniut I will be happy to talk all day about it, but only if they bring it up first. I completely agree with you. It is unfair and embarrassing to be told from a stranger how one should dress. First if all how do they know if that particular woman really tried to the best of her ability to dress modestly that day. She is also a stranger and majority of people have a hard time accepting rebuke from people we are close to. A person who is truly trying to work on themselves is not going to be paying attention to how other people are dressed but concentrating on themselves. I personally am not bothered by the women who wear shawls and layers, if that’s what they want to do to feel more tznius that’s their business. Women should not feel threatened by it, we should all just concentrate on our own avodat hashem and how we can strengthen our emuna and bitachon by what we can do and not by what others are doing. Behatslacha ! Actually, the shulchan aruch states that one should not wear 2 sets of tefillen in shul because of Yohara (deceiving oneself and/or others as to ones true level by overdoing it)(nowadays there are whole communities that follow that custom, so it’s permitted for the individual). Does the music graduate live in Beit Shemesh? I’m looking for a teacher for my daughters. Glad to hear Rzn. Heller’s gentle criticism of the practice. The women, of course, are not violating halacha and can do whatever they want. (Personally, I’m not sure that’s the issue worth embarrassing your teenager for, but that REALLY none of my business.) But we need to be cautious about raising the wrong bars in terms of expectations in frum society, and for some women who might be questioning themselves, hearing Rzn. Heller will be validating. Wishing everyone a Shana Tova u’Metuka. However, the telling strangers what to do – does not strike me as wise, however positively intended it may be. Tochacha is an art form. Also, not sure that the statement about Ashkenazi psak for girls’ clothing starting at age 3 is so simple. really? what’s not simple about it? I learned (as someone here comments) that it’s mishneh brura age 3 vs. chazon ish age 5 – 7 when she begins looking like a “young girl”. curious if others are following another halachic opinion or just doing as they see fit, especially since I haven’t seen individuals (or communities) who aren’t dressed tznius at some point well before 12 then begin following all halachos fully at 12 either. I haven’t seen it all though, so by all means, curious if that exists! At the very least, there’s also the issue of chinuch, doesn’t everyone begin teaching, encouraging the practice, etc. of other mitzvos before 12? why would they wait until the last minute for tznius, when it’s so much harder to make that change then most others? I’ve heard that Rav Ben Zion Abba Shaul ztz”l (Sephardi gadol) said girls should be dressed tzniusly from infancy. I’m sure this isn’t the halachic ruling, but rather something spiritual. I am sorry for the loss of your friend Hagit. I’ll send what I can, and do an extra act of kindness in her merit. May her memory be a blessing, and her family be comforted. There is a story in the Rebbetzin Kanievsky biograpghy about a woman who started dressing in a burka in Bnei Brak. The Rebbetzin went to her house and told her that before we aim to be like the imahos, we should try and aim to be like the generation before us, and so advised her to try and emulate the tznius of Sara Schneirer. The woman took off the burka. I’m just wondering, if this is about frumkeit, hiddur mitzvah, mesiras nefesh etc why this trend hasnt taken off in places like Bnei brak, Ofakim etc. where people are very concered about their avodas Hashem. I think, in my limited view of things, that the difference is that in Bnei Brak daas Torah is taken seriously by everyone. Non of the Gedolim have said we should look this way. One of the women interviewed said ‘Eisav said yesh li rav’. If you follow a rav you’re comparable to Eisav? Also I don’t think wearing the shawl is the same as wearing the burka. As far as I’m aware the shawl was started by the Toldos Aharon community when one of their Rebbes suggested it to a relative as a zechus to have children. So there was daas Torah involved. But to make up your own Torah is a dangerous thing and that’s why I feel strongly against it. IF your daas Torah says that this is the way to go, then it’s absolutely justified. If not, it’s yuhara (an arrogant form of piety). But a person also chooses their daas Torah, and it seems–IMHO–that these types of families choose their rav/community based on the level of tznius. So there is something imbalanced there. I know several completely normal Toldos Aharon women who wear a shawl or raincoat (even in summer), but it looks nothing like the picture above. It is refined and does not isolate them or cover their faces. This is a side comment; I watched the video with Hagit bat Leah, and she looks and sounds like a very special person. I saw that she lived forty years, that is a very significant number, even more amazing about this special neshama. I’m wondering if there were ever any women who took on these items of clothing who then backtracked and are now “regular” modest? I know that at one point I took upon myself to at first wear only shirts, then to button up to the top: when this started to depress me I was advised to let it go. Baruch HaShem I’m now , I hope, serving Him from a happier place that is ME. Anyone out there taken on a chumra in modesty who gave it up? i wore only closed shoes and got terribly infected toes. when my husband (then fiance) told me that there was no halacha about covering toes, i ran out to buy some sandals. I have never looked back. I am no Talmud Chacham, but it seems to me that a lack of Tzniyut is about being attracting, not attractive. My understanding is that a woman should look nice. A lack of Tzniyut is about flaunting it, not having it. Hiding under layers of cloth is more about shame. It says to me that you believe Hashem made a mistake when he designed the form of a woman and when he made you one. Do these women not mean it when they thank Hashem each morning, She’asani Kirtzono? It’s all about “feeling”, about Me and my Image. A strong corrective dose of Rav Wolpe on ״פרומקייט״ would go a long way. im surprised a little by the support for this extreme chumra or whatever you want to call it. according to many leading rabbis “its not daas yehudis” and Jewish women do not have a mesorah to take this on… on the contrary.. the biggest chassidish rebbetzins were always wearing very elegant, stylish and royal clothing.. that of bas melech. rtz. schneerson even wore modern stylish little hats after the war (like royalty) and no sheitel at times.. i bless to be proud of our beauty and malchus and learn the inner torah of tzniyus. This is a very late addition to the conversation but so interesting: a letter writer to mishpacha magazine wrote (I’m paraphrasing) that the ” burka women” are on the same wavelength as the secular world only their response is the opposite: both worldviews objectify the female body, one seeks to flaunt it- the other to cover it up. But for sure neither are focusing on the neshama…. I thought that was very perceptive and agree totally. I am not sure at all how I wound up reading this now, September 4, 2014, almost a year after it was published on jewishmom.com! But I loved Rebbetzin Heller’s words. What she said, and how she said it. And all the wide range of comments were fascinating. People REALLY are different. Accepting our differences is THE challenge of the day, and the thing that holds back Moshiach (sinas chinam). To be sure: I would never wear a shal and burka. Never. Even though we are told to never say never, I’m saying never.